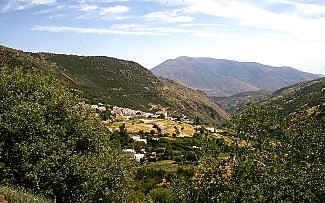 property description: Los Molinillos, located between the two "white" Alpujarran pueblos of Bubion and Capileira is a five acre Cortijo that was abandoned for thirty years, saving many of its old chestnut, oak, poplar and fruit trees from being cut down to clear the land for agriculture . The original farmhouse had been reduced to a pile of rubble, which allowed us to rebuild in traditional, stone-clad style but incorporate many passive solar features. South-facing, with double glazing in all the windows, we incorporated a massive amount of insulation into the cavity walls and ceiling, ensuring the house maintains a comfortable temperature and humidity all through the year. Both the main house and the rental apartment have wood-burning stoves, utilizing wood collected on the property and no non-renewable energy is needed for heating. We have an efficient solar electricity system, with a large battery bank. There is a back-up generator for the rare occasions when we have more than a few days of bad weather. The collected solar power is transformed by inverter into 220V throughout the accomodation. There is telephone and internet access. Fridges and stoves are butane. We try not to use chemicals on the land or trees and grow a lot of our own organic vegetables and fruit. Bubion and Capileira are about ten minutes walk away if you don't want to use a car. location: Los Mollinilos is located in a unique micro-climatic pocket of fertile land on the southern slopes of the Sierra Nevadas. 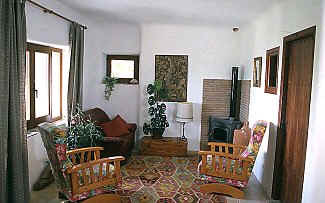 It is a lovely place for a relaxed holiday and a great base for walking, bird watching, mountain biking or horse riding. A walking or bird watching guide can be arranged. Bookings for the Alhambra in Granada can be made from here (by telephone) but because of the current controlled daily numbers of visitors, the dates you want should be thought of well in advance. When you leave the Granada/Motril highway to head for Capileira, the road wriggles like a snake as it climbs up into the Sierras through Lanjaron and the large market town of Orgiva. 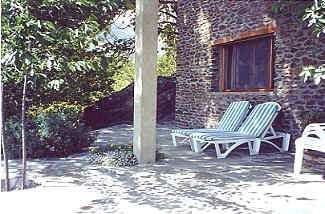 When you reach Capileira, you will be at 1400m and in an area that is a totally protected natural park. From here you look all the way back down to the coast and across to the Rif mountains in Morocco. The highest peaks of the Sierras, with their truly unique flora and fauna, are above you still and you will need to climb another 1600m or so to reach the summit of Mulhacen, the highest mountain in mainland Spain. The air here is clean and fresh. The hills are normally covered in grass and wild flowers, and there is a large variety of trees growing locally. The many cherries, almonds, walnuts and other fruit trees paint spring with clouds of coloured blossoms. Local village houses are cubist images of Moorish inspiration with white washed walls, flat roofs of gritty, dark sand and tall chimney-pots like elongated toadstools. The streets are narrow, cobbled and overhung with small terraces filled with pots full of flowers. There are numerous restaurants and bars in the small local villages and reasonably well-stocked supermarkets, cantinas, bakeries and souvenir shops. other details: There is a large, secluded terrace attached to the apartment with sunloungers, as well as a table and chairs for outdoor eating. A barbeque unit is available. There is private parking and a short, tree-lined walk to the apartment. The nearby waterfall is accessible and can be used to cool-off in the hottest months. Motril or Solabrena beaches are about 70km away. Granada airport is 70km away and Malaga airport 150km. Car hire is recommended.